Remember those little chocolate hazelnut candies that came individually wrapped like a little present in gold foil?? They are now a distant food memory, but I can still taste them… Well those little guys were my inspiration for today’s cookie. This is kind of bizarre the way this recipe turned out, but you will only need 1 size measuring cup! Make cookie dough: Whisk together melted butter and honey. Stir in dry ingredients (except hazelnuts). Combine well. 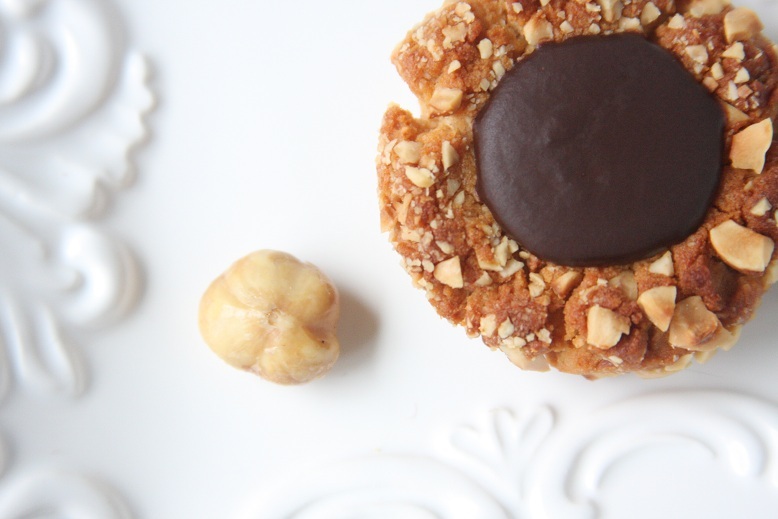 Using a cookie scoop or hands, shape into 24 rounds. Roll in chopped hazelnuts. Place cookies on baking sheet and making a good size “thumbprint” in each cookie. Bake for 16-18 minutes until golden brown. Place on cooling rack and let cool completely before filling with ganache. They will seem soft at first, but will firm upon cooling. Meanwhile, prepare the chocolate ganache. Gently melt the chocolate and honey together. (Be sure not to overheat as the chocolate will burn!) Carefully add room temperature butter, 1 tablespoon at a time. Keep whisking until shiny and smooth. 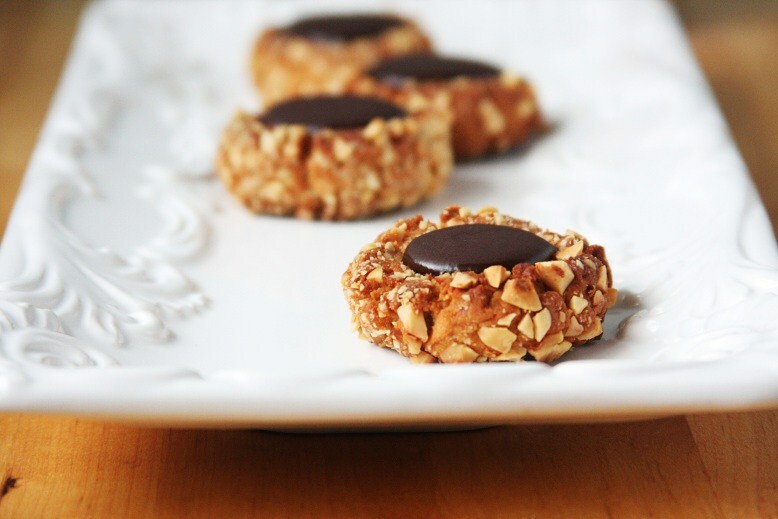 To fill the thumbprint cookies, carefully pour ganache mixture into each cookie. Or you can gently fill the cookies with a small spoon. (Or use a ziplock bag with the tip cut off to pipe in the filling.) The chocolate will eventually set at room temperature, but you can place the cookies in the fridge to speed up the process. This recipe is very versatile. You can use any nut you would like, and easily change out the filling to your favorite jam. The possibilities are endless! I made these biscuits today and everyone loved them :). I used grapeseed oil instead of butter since we can’t have dairy, I had to add a bit more flour since it was quite oily. They tasted great and I’ll be making these regularly. Thank you so much for the great recipe.